There may be an ongoing debate on the lack of diversity in Hollywood leading to a consistent lack of diversity at the Oscars, but last night, the 11 Tony Award wins for ?Hamilton: An American Musical? proved otherwise for Broadway. Although ?Hamilton? focuses on the lives and careers of America?s founding fathers, principally Alexander Hamilton, show creator Lin-Manuel Miranda, who himself plays the starring role of Hamilton, flipped it and cast a set of actors that includes African Americans and Latinos. ?I wanted to make the cast representative of what America looks like today,? Miranda has said in several interviews. And several members of that cast won top awards at last night?s 70th Annual Tony Awards. Daveed Diggs won the award for Best Performance by an Actor in a Featured Role in a Musical; Renee Elise Goldsberry won the award for Best Performance by an Actress in a Featured Role in a Musical; Leslie Odom, Jr. won the award for Best Performance by an Actor in a Leading Role in a Musical; and Lin-Manuel Miranda won two awards for Best Book of a Musical and Best Original Score (Music and/or Lyrics) Written for the Theater. While onstage accepting the award for Best Musical, ?Hamilton? producer, Jeffrey Seller, thanked the ?Hamilton? company for sharing their vision of America.? ?That vision embodies the best values, the best impulses that make our nation a beacon to the world: inclusiveness, generosity, ingenuity and the will to work hard to make our dreams come true,? he said. And when President Barack Obama and First Lady Michelle Obama proudly introduced ?Hamilton,? they remarked, ?Hamilton has become not only a smash hit, but a civics lesson our kids can?t get enough of; one with fierce, youthful energy; one where rap is the language of revolution, and hip-hop, its urgent soundtrack.? It?s a musical about the miracle that is America; a place of citizenship where we debate ideas with passion and conviction; a place of inclusiveness where we value our boisterous diversity as a great gift. A place of opportunity where no matter how humble our origins, we can make it if we try. That?s the story of America; an experiment that is not yet finished; a project that belongs to all of us. America is what we the people make of it. As long as we stay, just like our country, young, scrappy and hungry. That is the story of Hamilton.”? ?? The “Hamilton” cast then took the stage to thunderous cheers and applause before performing a scene from the show. Best Book of a Musical: Lin-Manuel Miranda, ?Hamilton? Best Original Score (Music and/or Lyrics) Written for the Theater: ?Hamilton? Best Performance by an Actor in a Leading Role in a Musical: Leslie Odom Jr., ?Hamilton? Best Performance by an Actor in a Featured Role in a Musical: Daveed Diggs, ?Hamilton? Best Performance by an Actress in a Featured Role in a Musical: Renee Elise Goldsberry, ?Hamilton? 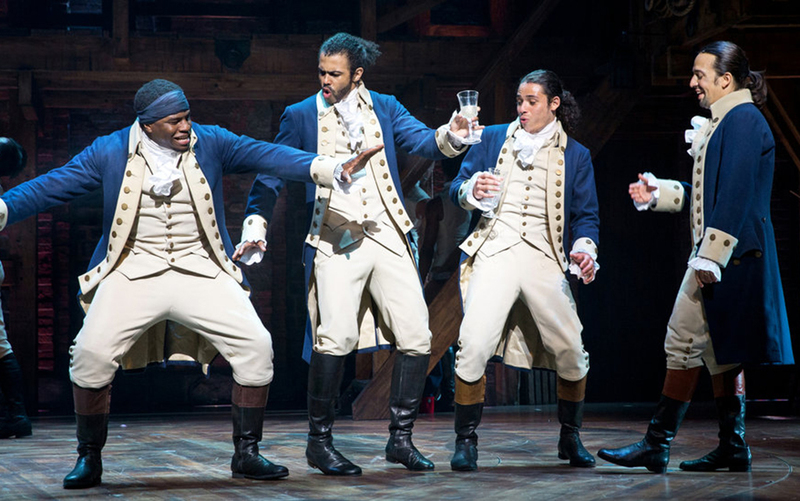 Best Costume Design of a Musical: Paul Tazewell, ?Hamilton? Best Lighting Design of a Musical: Howell Binkley, ?Hamilton? Best Direction of a Musical: Thomas Kail, ?Hamilton? Best Choreography: Andy Blankenbuehler, ?Hamilton? Best Orchestrations: Alex Lacamoire, ?Hamilton? Other actors of color who were nominated and won Tony awards include Christopher Jackson of ?Hamilton? and Brandon Victor Dixon of ?Shuffle Along? who were both nominated for Featured Actor; Savion Glover, nominated for Best Choreography for “Shuffle Along;” Lupita Nyong’o of Eclipsed nominated for Best Actress; Dania Guria of Eclipsed nominated for Best Play; Saycon Sengbloh and Pascale Armand of Eclipsed, both nominated for Featured Actress; and Cynthia Erivo, who won the Tony Award for Best Actress in a Musical for her performance in the Broadway revival of The Color Purple. Erivo’s win rounds out a total of four Black actors who won the major musical acting awards of best actor, best actress, best featured actor and best featured actress. This is the first time it’s happened in the ceremony’s history.